Gary Galen Glick (May 14, 1930 – February 11, 2015) was a professional American football safety who played seven seasons in the National Football League. He was the first overall selection in the 1956 NFL Draft, and the only defensive back to be picked first overall. Glick attended Colorado State University, where he starred as a quarterback. 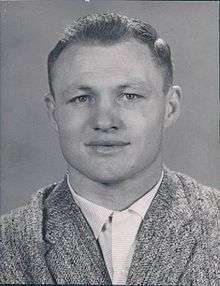 Until 1985 he was a head coach for the Norfolk Neptunes and then the Montreal Alouettes before becoming an NFL scout. Glick died on February 11, 2015, aged 84, at his home in Fort Collins, Colorado, following a stroke. ↑ "Passing of Gary Glick". csurams.com. February 12, 2015. 1 2 Obituary, post-gazette.com; accessed February 15, 2015.